The Next Step | Clark Financial Group Inc.
"The Next Step" is an invaluable tool both for those walking through the loss of a loved one and for those preparing for such a loss. Using real-life scenarios coupled with sound professional advice, Dr. Clark addresses in detail issues that need to be faced and provides access to helpful resources, documents and spreadsheets. 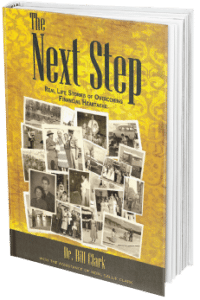 He combines much-needed step-by-step direction with the experiences of others, making "The Next Step" a very readable and practical resource. Believing preparation is the key to making wise and informed decisions and to moving forward without undue stress, Dr. Clark guides the reader through the myriad of details that will need to be considered and addressed. Whether a family is experiencing the grief and trauma of the loss of a loved one or the stress and trauma of divorce, Dr. Clark's aim is to enable his readers to be prepared in advance for the numerous decisions to be faced before the time is upon them.